Application for Award 2018/2019 – closed now! 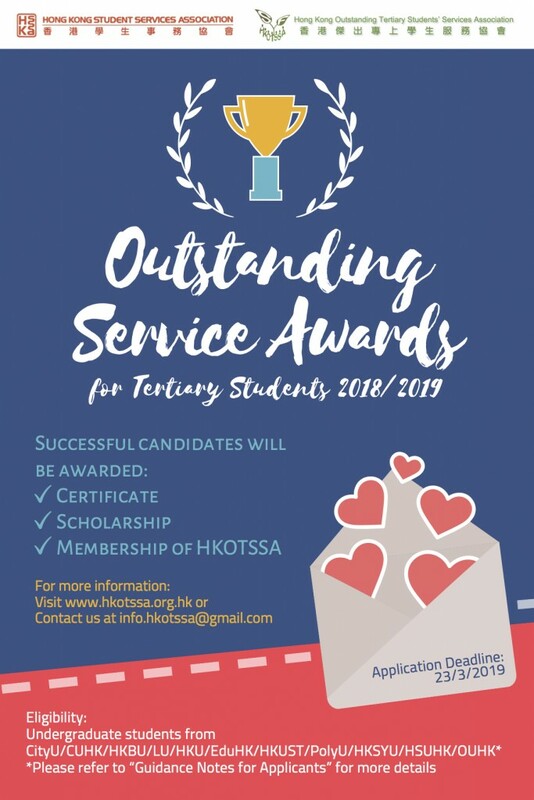 This year, the Hong Kong Student Services Association (“HKSSA”) and the Hong Kong Outstanding Tertiary Students’ Services Association (“HKOTSSA”) continue to co-organize the selection of the Outstanding Service Awards to students enrolled in full-time University Grants Committee-funded sub-degrees, undergraduate or postgraduate programmes at the local universities. The award was introduced in 1991 to recognize tertiary students with outstanding leadership and significant contribution to the community. Application deadline: March 23, 2019 (Saturday). Shortlisted students will be invited to sit for an interview which will be held on 13 April 2019 (Saturday). Successful candidates will be awarded a certificate, a scholarship and HKOTSSA’s membership. In addition, HKOTSSA also provides you a great opportunity to meet like-minded passionate friends from different universities and previous awardees. For more details, please refer to http://www.hkotssa.org.hk/awards/outstanding-service-award/. For more information, please contact us via email at info.hkotssa@gmail.com. We look forward to receiving your application! We have a new book coming out! Hong Kong Outstanding Tertiary Students’ Services Association (HKOTSSA) published our new book, Colours of life Dialogue with Ethnic Minorities in Hong Kong. The book is written by HKOTSSA awardees and its hopes to raise awareness of the issues concerning social minorities in Hong Kong, encourage more university students to participate in community service, and promote compassion and mutual respect between target group and service volunteer. It will be available for purchase in local bookstores very soon! Please click HERE to view the brochure of the Outstanding Service Award for Tertiary Students Presentation Ceremony 2017/18, and find out more about the winners!